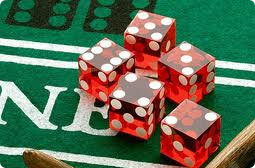 Online Craps is one of the friendliest and most exciting casino games. Loved by online casino players in Singapore, due to its easy game play and simple bets, online Craps is a dice game where players put bets on the roll of the dices. Online Craps is usually run in the similar way as land based casinos. Every game has a shooter who is throwing the dice, in an online casino the throw is controlled by Random Number Generator. Prior to the 1st or 'come out' roll, online craps players place bets on the 'pass line'. The payouts on these bets rely upon the come out roll. The game of craps starts with the roll of 2 dices. The person rolling the dice is called the shooter. In a Pass Line bet rolling a 7 or 11 gives an instant win and a 2, 3 or 12 means losing the game. Any other number is called a Point and thus shall be re-rolled again till the number repeats in order to win the bet. Rolling a number 7 prior to re-rolling the point number ends the game in loss. In Don’t Pass Line, which is another popular bet, the rules are entirely opposite. Here a roll of 2, 3, wins the game, a roll of 12 is Push and a roll of 7 or 11 is a loss. Also once a Point is determined, player needs to roll 7 before the point number to win the bet. The best strategy when putting bets is to cut down your losses by only putting bets with the lowest house advantage. The Come/Don't Come, the Pass/Don't Pass are the bets with the lowest house advantage. Adding on you should always get the odd bet as it has no house edge. As there are an enormous number of bets you put at the Craps table, there are a huge number of betting systems that players depend on. Basic knowledge of the betting option available is a good strategy to avoid any confusion when playing the betting amount; you don’t want to bet on Pass Line while playing rules of Don’t Pass. Still, note that this is a game of chance and there is no recognized system that can beat a craps table. Thus, managing your bankroll for betting in Craps, playing with right betting option and basic idea of the rules is the key to make the best of your winning odds. Casinos offer Live Crap games to players due to its increasing popularity and acceptance worldwide. Live Dealer games are interactive and entertaining as they render real casino experience to online players. It has a multi player setup thus it adds on to the fun and it is also available for play on your mobile phones.